The Swindle is a 2D, side-scrolling steampunk roguelike stealth game set in Victorian London. You are a master thief, tasked with infiltrating Scotland Yard before they finish building their crime-busting supercomputer and put you out of business. The catch? You only have a hundred days to do so, and you need to pull of heists to build up the money, skills and items that you need to take a crack at taking down Scotland Yard itself. The Swindle makes a great first impression. The art style is gorgeous, with a quirky sense of humour in both the visuals (the robotic security guards you battle are adorable) and in the, admittedly very minimal, writing (such as the randomly generated character names – my favourites so far being Sally Weedbruiser, Adella Underwhelmer and Xavier P. Botkiller). The sound design is great, the retro-futuristic backing track ticking away ominously and perfectly complementing the steampunk aesthetic with its mechanical clanks and clangs. You start with only a hundred days until Scotland Yard put you out of a job, and each heist that you attempt takes a day, meaning that very soon you’re feeling the pressure of a ticking clock. The game has a strong sense of progression as you spend your ill-gotten gains in your airship base, unlocking additional skills, powers, and items, such as the ability to hack the steam-powered terminals you will find inside your targets, bombs, a double or triple or even quadruple jump, and many more. Each game day allows you to take a single crack at a “heist” – your character arrives at a location in a steampunk drop pod, breaks in, steals all the money they can, and leaves, hopefully without being caught. If you are seen the alarm goes off, giving you a finite amount of time to grab what you can and get out before the police bots appear, making reaching your pod to escape all the harder. You must be precise, because a single blow from an enemy kills you, ending your run. Although you start off targeting basic slum dwellings defended by crude steampunk security devices, you can pay to unlock new targets such warehouses, casinos, and the houses of the rich, which earn you a lot more money but are protected by much more sophisticated sentries, alarms, and guard-bots. The Swindle can be a real blast. There is satisfaction to be had to breaking in, grabbing all the money and getting out again without being seen. Each level is a little puzzle that requires thought careful planning to crack – unless you are spotted, when the gameplay changes to a frantic, intense race against time. Leaping a group of police bots as they storm into a building looking for you then being whisked away from the scene of the crime with all your loot feels great. So far, so good. Unfortunately, this kind of game requires precise, responsive controls that players can rely on under pressure. 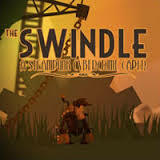 The Swindle fails because its controls are sluggish and unreliable, leading to unnecessary deaths. Jumping and dashing are not quite instantaneous, and often you will stick to walls you weren’t quite touching, spoiling a drop on a guard or causing you to be seen instead of leaping into a hiding spot. Because a single hit kills you and ends your run, these control failures are often fatal. Even worse, each successful heist increases your loot multiplier, which in turn increases the amount of money you make – but you lose this when killed, sending you back to square one and restricting your ability to make money, unlock what you need, and reach the end of the game. Although your upgrades pass on to your new thief, if you run of days the game is over, and you have to start again from scratch with nothing. There are problems, too, with the game’s progression, mostly related to the way it randomly generates levels. The layouts of the houses, warehouses, casinos and suchlike that you attempt to rob often make no logical sense – this could be overlooked if they were still playable, but several times I have had leave the area immediately, unable to reach huge chunks of the level either because I don’t have enough bombs to tunnel down, or enough jump upgrades to climb up. This causes you to end up one step closer to overall failure without even being able to try. There is a lot here to like – an interesting idea, a unique and quirky cartoon art style, and some wonderfully tense moments engendered by the game’s unforgiving gameplay. Unfortunately all the good The Swindle does is undone by sluggish and unresponsive controls and a plethora of bugs that tip the game into the realms of controller-throwing frustration. I have played through two full 100-day playthroughs of The Swindle, but have died pointlessly too many times to want to go back. Dying in games can be good – in titles like Dark Souls, you learn something from dying, and get better each time. In The Swindle, it just feels cheap. I will be keeping an eye out to see if any of these issues are patched and make the game less frustrating to play, but as it stands I won’t be playing it any time before. I want to like the Swindle, I really do, but at the moment I just can’t.